There are more about 6,000 species of green algae. Green algae may be found in marine or freshwater habitats, and some even live on land, growing on soil, trees, or rocks. 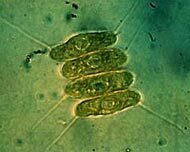 Green algae are found in 3 forms: unicellular, colonial or multicellular. Many species live most of their lives as single cells, while other species form colonies (living as a loose aggregation of cells) or coenocytic (composed of one large cell without cross-walls; long filaments, or larger macroscopic seaweeds. Green algae are found in temperate and tropical waters. They grow attached to the bottom but not great depths asthey require good levels of light to photosyntesize. They are often seen in the intertidal region of rocky coasts and in tide pools. Many can tolerate low salinity levels and will colonise areas where rivers meet the sea. Green algae occur in a wide variety of shapes and sizes. 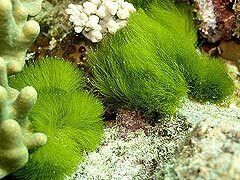 Sea lettuce (Ulva), sea grapes (Caulerpa) and turtle grass (Chlorodesmis) are some of the most abundant types of green algae on coral reefs where they play an important role. 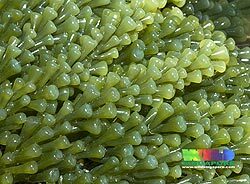 There are about 50-100 common green algae on coral reefs and form the major source of food for most herbivorous fish and many other smaller animals (e.g. crustaceans, worms and gastropods) on reefs. They store food as starch, some fats or oils like higher plants. Green algae follow a reproduction cycle called alternation of generations and also reproduce asexually by fission (splitting), budding, fragmentation or by zoospores (motile spores). Dunaliella salina Organic beta-carotene (one of the green pigments in Green algae) is grown in Australia from the hypersaline ( high salinity water))green alga Dunaliella salina grown in large ponds. Carotene has been shown to be very effective in preventing some cancers, including lung cancer.